Eating Breakfast Burritos have to be one of my favs! They take no time to make and seem to satisfy everyone ( minus the spice for the kids of course! ). It also reminds me of my good friend and old flatmate Jo Jo. We’d spend some memorable Saturday mornings, hangover in bed ( pre-kids ), eating breakfast burritos and giggling. Those were the days! The ultimate comfort food wrapped in a neat parcel packed with a spicy punch, and often followed by an equally spicy Bloody Mary chaser! 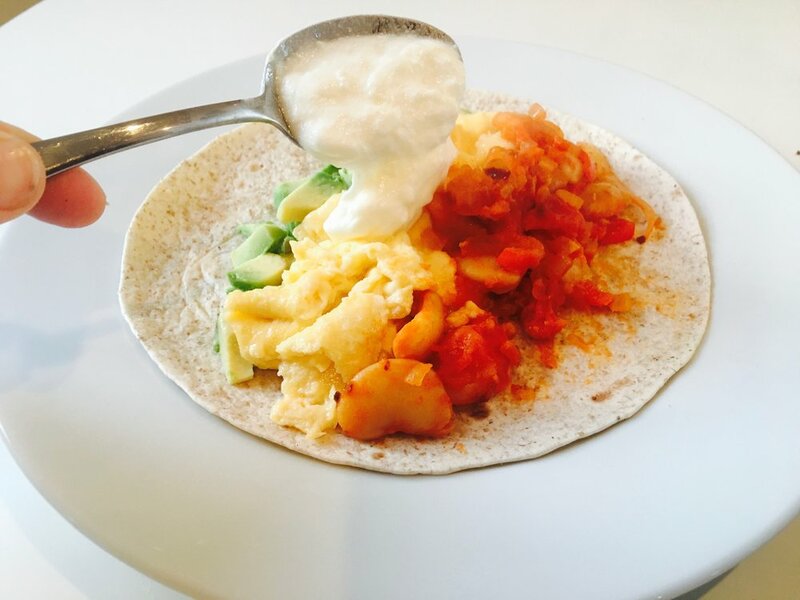 I was inspired to make a healthy burrito using homemade spicy butter beans to add to my chopped avocado and silky goats cheese scrambled egg. The flavours together are tremendous! I did my homework on Butter Beans, they have awesome nutritional value! 1/2-cup serving, which is 130 grams, of butter beans contains 100 calories, or just 77 calories per 100 grams of beans. Butter beans are considered a low-energy-dense food, which means it has a low-calorie content compared to its serving size. Including more low-energy-dense foods in your diet helps control hunger when limiting your calorie intake to help you lose weight or maintain a healthy weight. And like other beans, the butter bean is a well-rounded source of nutrition, rich in protein, fibre, iron and B vitamins. Woo hoo! Result. My husband and I are greedy, so we eat 2 burritos each, but this recipe could in theory feed 4 people. Pre-heat the oven to 180 - 200. Encase the wholemeal wraps into tin foil and seal all the edges and set aside. Prepare your chopped avocado and squeeze over some fresh lemon juice. Set aside. Whisk the eggs together and add big chucks of goats cheese + a big pinch of cracked pepper. Set aside. On a medium heat, heat a large frying pan with a 1 Tbsp of olive oil. Fry the chopped onions and garlic until transparent. Add the red pepper, chopped cherry tomatoes and tomato paste. Cook together for a few minutes until the tomatoes are soft. Add the butter beans, chilli flakes and smoked paprika. Cook together for a few minutes until the beans are coated in spicy tomato sauce. Set aside on a low heat. Add a little water if it starts to get dry. Put the wholemeal wraps + plates into the oven to warm through for 5-7 minutes. Gently heat another frying pan for the scrambled eggs. Add the egg mixture and scramble slowly. Careful not to over turn and mix the egg mixture too much. More of a slow folding motion until the eggs are cooked and the cheese silky and melted. 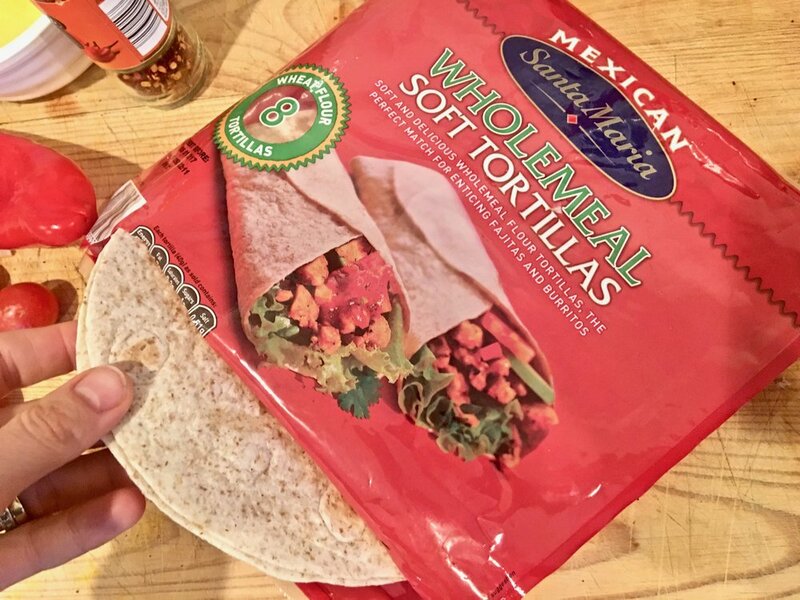 Take out your warm wholemeal wraps, place one wrap on a warm plate. Add a thin line of avocado, scrambled egg and spicy beans. Top with plain yogurt, coriander or parsley and cracked pepper and roll into a neat burrito. Tuck the bottom in! It can be a messy business to roll but be sure not to over stuff! I like to cut mine in half for easy stuffing into the gob. Enjoy!